The Bloggy Awards: Promo Queen/King Nominees! For the Promo Queen/King nominations, we asked that everybody find an author or publisher to write a brief few paragraphs or so on why they helped promote their books. Ashley has been invaluable to me as an author. Her blog attracts a large audience of people who trust and value her opinions. She runs her blog with a level of professionalism and excitement that her followers can feel. Ashley is forward thinking and innovative in her approach of helping authors and displaying their books to the world. She's creative in everything she does. She captures and exudes the enthusiasm that makes reading and books so special, which inevitably sets her apart from other bloggers. Authors rely on word of mouth to sell their books and no other blog starts or stirs the word of mouth like The Bookish Brunette does. I owe many of my sales to her, as well as her garnering interest with other bloggers to read my book. Bookish Brunette is totally awesome because she's created "Team" buttons for characters in my Jenny Pox books, and she created some amazing graphics for the "fair" event on my blog in June. Most fabulously, she came up with the idea to send nifty secret invitations to book bloggers when inviting them to sponsor the fair. She's also done other stuff! Lots of it. Like, really a lot. Ashley sold more of my books the day I was on her blog than everyone on my tour COMBINED. She's the first person I think of for any list of book bloggers! Let me tell you why I call Giselle the Oprah of the book blogging world. Although I’ve been writing since I was five, I didn’t enter the YA scene till last year. This past February I released Entangled, a magical mystery or, in Giselle’s words, “Freaky Friday Gone Wrong.” I had three big hurtles stretched before me as a self-published, debut author with no followers or pose of friends to cheer me on or write reviews. I think it’s safe to say I spent more time contacting reviewers than I did actually writing the book! Part of that process was checking out blogs and reading review policies. Along the way, I came across Xpresso Reads and was impressed by the fun, professional look and tone of the blog. When I saw the amount of participation in the comments section I was dying to get my book on Xpresso Reads. Giselle not only accepted my review request, she featured the cover in a In My Mailbox post, which generated a great deal of interest and cover love for Entangled in her comments section. I don’t have any hard data, but to this day I believe that Giselle kick-started my career as an independent author. Her IMM was shortly followed by a guest post and giveaway, which generated even more interest. Suddenly I was able to contact reviewers who had already expressed an interest in the book at Xpresso Reads. I met some really cool reviewers this way who came through for me in a matter of weeks. Then in June Giselle chose the serendipitous timing of posting her review of Entangled as my blog tour for book two was coming to an end. I must just be lady luck because I’ll tell you what, that review kept the momentum going and sales flying. Giselle truly is a queen! I started my blog in September 2011 after having been reviewing on Goodreads for a year, and before that on a Facebook app. It's mostly YA novels that are covered but I do enjoy and review adult books as well. I post an average 4 reviews a week. My design was made by Parajunkee which turned out better than I was expecting, I do my own banners for tours and sidebar, however. I have a "book of the month"on my sidebar which is called (the month's) brew that I chose either my most anticipated, or a book I have already read and loved, that is releasing this month. I also have my previous month's reviews on my sidebar: A feature I thought of and started back in November, 2011 which people seem to really like by the feedback I've received. It also let's people see reviews that they may have missed, and at the same time the reviews get "featured" on the blog for longer. I'm very social and I love to chat with other bloggers which is my absolute favorite part of blogging. This is something I love and I hope it shows in what I give you! So, to say a little something about my favorite blogger won't be hard. She was the first blogger to review me over a year ago. She's always been there for anything I needed posted or revealed. Whenever I have a book come out, she's the first to read it and I fret about whether or not she likes the books as the series continues because in my mind, she's on the pedestal for all the bloggers that I use. Anytime someone says something about an awesome blogger or needing someone to review their books, I always think of Mandy first. And it's not just me. This chick is practically EVERYONE'S favorite blogger. She's sweet, she's professional and quick. She's truthful, honest, and generous of her time. She posts something on her blog every day to review or promote someone, even if there's nothing to gain from it. I've moseyed over to her blog a few times and seen posts for things for me that I didn't even realize she had posted! She's always got at least one giveaway going at any time and there's no jumping through hoops to enter the giveaways like on some blogs. She makes it simple and genuinely just wants to get the word out about good books. Bloggers don't have it easy like everyone thinks. All that time reading and writing the reviews and posts and getting tours and things ready takes SO much time. I'm grateful to Mandy that even when I hand her something last minute, she always takes the time to throw something together. If I ever meet her in person, a tackle-hug will be involved. I have no doubt that all the good words she put out for me have helped me tremendously. This chick rocks. This chick is sugar sweet. This chick is the example of what all bloggers should be like. This chick is the Promo Queen. Hi, my name is Mandy, I am a mom to 3 beautiful, rotten girls. Kaleigh,12...Emma, 9...and Hanna, 5. My hubby works hard so I can be a stay at home mommy, play on twitter all day and read lots of books. I like to host giveaways, cover reveals, reviews, and post movie news on books that are making it to the big screen. I always try to do something for an author (like my fun Top 10 Interview) even if I don't have time to review their book. Cause even though I don't have time to read it...I want to get the word out to others who might like it. I also try to tell authors that my blog is always open to them...anytime they need something posted (like cover reveals, excerpts, giveaways) that my blog is there for them. They have a hard enough time getting started in this business...that maybe one of my little posts can help promote their book. Message from Kait about the blog: Hi, everyone! 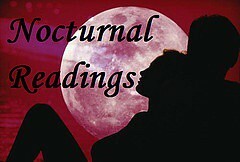 I started Nocturnal Readings in July of 2010 both as a way to promote my own author name and to help my fellow authors, as well. 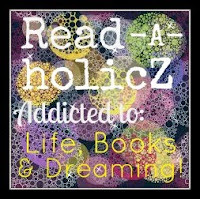 My reviews and author interviews/guest posts consist primarily of the paranormal romance, urban fantasy, and YA genres, but I've been known to branch out into other genres on occasion. As an author for HQN Books (Harlequin's single title line), I know how important it is for authors to build an active social media platform and spread their name to readers in every way they can, so when I decide to aid a fellow author by interviewing them, allowing them to guest post, hosting giveaways, or doing an honest review of their work at Nocturnal Readings, I wholeheartedly devote myself to promotion of that post--though I do always encourage my authors to post on their own, as well. I post my reviews to Amazon, B&N, Goodreads, Shelfari, and sometimes LibraryThing, and I actively promote all my author related posts on Facebook, Twitter, Goodreads, and Google+, along with multiple email groups/author forums I belong to, underneath both of my author pseudonyms (Kait Ballenger for my PNR and Kaitlyn Schulz for my YA). Some of the authors I've interviewed or hosted include: Laura Kaye, Amanda Carlson, Kate SeRine, Kristin Miller, Jenny Sulpizio, Lea Nolan, Catherine Bybee, Christine Ashworth, and Lynnette Hallberg/Austin. In the coming months, I'm In the works of trying to secure interviews/posts with authors Cecy Robson, Julie Walker, and Jamie Rush. Social media is one of the best ways an author can spread his or her name nowadays and I pride myself in helping make that promo successful.